Miflex Xtreme LP Regulator Hose 150 cm - 60" (Pink) - 3/8"
Scuba diving is a fantastic sport, but sometimes things can and do go wrong with equipment from time to time, even for the most experienced of scuba divers and snorkellers. Have you ever been heading out for a long awaited dive and discovered that your mask strap has snapped en route? Or the water is really choppy and your dive companion is greener than a jar of pond algae? Yes, these things do happen! Thankfully, although minor issues such as these can seriously stuff up a dive, being prepared for every eventuality is the best way to minimise the disruption caused by motion sickness and minor equipment malfunctions. Carrying a pre-packaged 'save a dive kit' is always a sensible approach, but what are the key items you should pack? The exact contents of a Save A Dive Kit aren't universal. What you carry should reflect the gear you have, the diving you do, and where you go to dive. Nonetheless, some things will be in most, if not all, save a dive kits. Spare Parts — it is good idea to keep spare parts for your equipment at all times, just in case a strap breaks or a hose splits when you put the first pressure on it. You should check your equipment regularly, which will enable you to spot when things are wearing out and replace them if necessary, but keeping a few essential bits such as fin straps, a mask strap and spare dive hoses may keep you in the water as opposed to being left behind to watch your dive mates from the boat. Mask Equipment — always carry a spare mask or Mask Strap, just in case something breaks. If you take a snorkel diving, then you also need a spare snorkel keeper. Fin Equipment — always carry a spare Fin Strap, just in case one breaks. You might like to consider including a set of Fin Buckles as well. Regulator Mouthpiece — your regulator is an essential part of your dive kit. If your primary 2nd stage regulator or octopus regulator mouthpiece is damaged or holed then you're either not going to dive, or you'll be diving very uncomfortably or dangerously. Mouthpiece sizes can vary, so please make sure you have the right size mouthpiece for your regulators. O-rings — O-rings are pretty important in scuba diving. From tank O-rings and dive light O-rings, to camera O-rings and valve O-rings, the time will come when you need a replacement in a hurry, so pack a few spares. Also make sure to include some silicone grease so that you can lubricate your O-rings properly. A suitable set of brass O-ring picks is often handy. See the O-Rings and Lubricants section of our online dive shop for some top choices. Zipper Wax — a jammed zipper is highly irritating, so keep some zipper lubricant handy at all times to ensure your dry or wetsuit zipper functions as intended. Popular choices are Gear Aid Zip Care Zipper Cleaner and Lubricant (60ml) and Northern Diver Zip Wax. A tooth brush makes a great tool to clean the zipper. Spare talc like Northern Diver Seal Saver Talcum Power is also handy for dry suit divers. Dry Suit Glue — no matter how expensive your dry suit was, it is not 100% immune to wear and tear, and sometimes accidents happen. So if you put your dry suit on and discover a tear in the leg, don't panic. Simply pull some dry suit glue, like Gear Aid Aquaseal + FD Repair Adhesive, from your emergency kit and fix it. Mask Anti Fog — if you haven't properly cleaned your mask then fogging can become a serious issue and ruin your dive. Sometimes you can't rely on spit to keep your mask free from fog and a more effective mask anti-fog agent can be more effective. See Gear Aid Antifog Sea Drops Liquid Drops. First Aid Essentials — all scuba divers should carry a first aid kit as standard. Make sure your first aid kit also includes waterproof band aids / plasters, sunburn cream, antihistamine, antiseptic cleanser, sting aid, chap stick, eye and ear drops, and pain killers too. We start with the large DAN first aid kit that comes in a Pelican case, and then supplement it. Motion Sickness Pills — nothing ruins a planned dive more than the overwhelming sensation you are about to throw up. Thankfully, keeping some trusted motion sickness pills to hand will settle your stomach and prevent any nasty episodes of motion sickness. Spare Batteries — even with a modern dive computer's low-battery warning, a dive computer battery can still make or break a dive day. Carry a spare of whatever battery your dive computer takes, plus the tool to change the battery, if needed. Spares are also useful for dive lights batteries. Camera batteries don't last forever, so why risk missing out on some fabulous underwater snaps? A camera care kit may be worth packing if your pictures are important to you. Tools — keep a set of scuba multi-tools handy, just in case you need to make a few emergency repairs to your equipment (assuming you know how to!). Hex wrenches that fit 1st stage plugs, wrenches for dive hoses, and appropriate flat head and phillips screw drivers are always handy. Make sure your tool kit contains some side/angle cutters, plus at least one adjustable wrench. An 8 mm Allen key to remove DIN/Yoke valve inserts is also very handy. 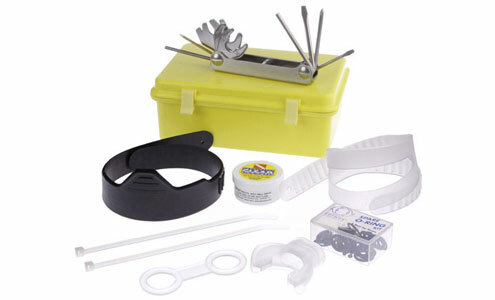 See the Dive Tools section of our online dive shop for some top tool choices. MacGyver Essentials — Sometimes you might just need to solve complex problems by making things out of ordinary objects, just like MacGyver. So you're going to need zip/cable ties, duct tape, electrical tape and bungee/shock cord. It's always handy to have side/angle cutters or nail clippers to cut off zip tie ends, plus scissors in your tool kit when using these materials. Swivel bolt snaps and double ended bolt snaps can often get you out of a tricky situation. Spare/Copy Certification Card — if you leave you cert card at home, keeping a spare certification card, or copy of one, in your save a dive kit might be the only way you get to dive in some circumstances. We also suggest you take photos of both sides of your certification card and keep them on your smartphone. When travelling on dive holidays, or to more remote destinations, we tend to supplement our local save a dive kit with a few more items. Dive Hoses — a spare HP Hose, Regulator Hose, and Inflator Hose, plus the air spools used to connect our SPGs to HP hoses are added because you can't know that the locals will have the ones you need. We also include some Schrader Valves and a Schrader Valve Tool for fixing problematic inflator hose leaks. DIN to Yoke Adapter — we dive with DIN regulators, so when travelling we carry a DIN to Yoke Adapter. While it's rare these days, it's still possible that where you're going may only have Yoke valve on their dive cylinders, and the adapter will get you diving. Inflator Kits — we always take a Power Inflator Inlet Valve Cartridge Assembly plus an Inflator Service Tool with O-Ring Kit with us on long dive trips. Some people prefer to just take a whole BCD Power Inflator Unit suitable for their BCD. What Shall I Keep My Kit In? Unless you keep everything in one place, you will inevitably forget something vital each and every time you head out of the door for a diving trip. A medium sized plastic or metal box will be more than sufficient for the purpose and is the perfect receptacle for keeping everything dry. It also helps to maintain a checklist of what's in the kit, which you can add to if necessary. Tak a look at the Waterproof Hard Cases we have available. Of course it's easy to go way overboard with save a dive kits. Indeed, if you carried everything that some say you'd need, your save a dive kit would take up more space than your actual dive kit. You may think that you don't need some of these items because you don't know how to use the tools, or make the replacements. However, there's likely to be someone around who does and can, but if you don't have the items in your kit, then they won't be able to help you.